Location: Istanbul, Cappadocia, Samanlik Bay, Olympus, Ephesus, Pamukkale, Med. Upon arrival to İstanbul meeting us and transfer to the hotel. After check- in the hotel your tour starts. Turkey is like a cradle of civilizations that you can find a chance to discover and see the art and prints of these civilisations in your 11 days Tour that covers İstanbul, Cappadocia, Olympus, Pamukkale, Ephesus. Upon your arrvial to İstanbul, you will be met and transfferred to your hotel. You will be picked up from your hotel at 09:30. This tour includes a guided tour of Golden Horn, a visit to Spice Market & Private Cruise Boat trip on Bosphorus water channel. At the End of the tour, you will be dropped to your hotel. You will be met and transffered to your hotel. you will be picked up from your hotel at 09:15. 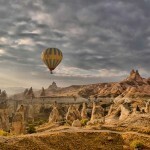 The first stop is Göreme Panoramic view. You will see fairy chimneys. The second destination is Derinkuyu underground city which is 3500 years old. You will go 8 floors down. The third destination is Ihlara Valley. You will hike about 3.5 km. At the end of the valley, you will have lunch in a village. After lunch, the next stop will be Yaprakhisar Panorama where you will see conical shapes which are similar to ‘Star Wars Movie Set’. And then you will be taken to Selime Monastry. You will comprehend monastic life better when you get there. After Selime monastry you will see Pigeon Valley. At the end of the tour, you will see onyx factory. (volcanic stone workshop). Your tour will finish at 17:30 and you will be dropped to your hotel. Accommodation in Olympos: you will stay one night in Olympos. After one night in Olympos, you will stay in a boat for 3 days. You will be picked up from Olympos between 10:00-10:30. Bus transfer to Myra, and to Demre for the St-Nicholas Church, shopping, banking and lunch. Boat departures from the harbour of Demre between 1 and 2 p.m. Pirates Cave (sea conditions permitting), Sunken City of Kekova. Simena, a traditional Turkish fishing village with no car access and Byzantine/Ottoman castle. In Gokkaya Bay optional water sports are available. Dinner, relax in this pirates haven or party the night away at the Smugglers Inn – First night on board. We will have Breakfast and then we will go to Kas. A swim stop in a nice and quiet bay in front of the little town. We will have Lunch there. Visit of this charming fishing village. Of ancient Antiphellos, as Kas was once known, only Lycian rock tombs & sarcophagi and the Roman theatre are left. But the charm of the town remains! Near Kalkan we stop in Aquarium or Firnaz Bay – Second night on board. Around sunrise we will depart for Butterfly Valley where we stop (sea conditions permitting!) for breakfast, swimming and to visit this natural reserve, hosting 136 kinds of different butterflies and moths. Oludeniz (The Blue Lagoon) is our next stop, again sea conditions permitting! Option for paragliding available. Lunch. Last stop of the day is St-Nicholas Island. Byzantine ruins, swim, dinner – Third night on board. We will have Breakfast and then we will depart for Samanlik Bay (swim & lunch). 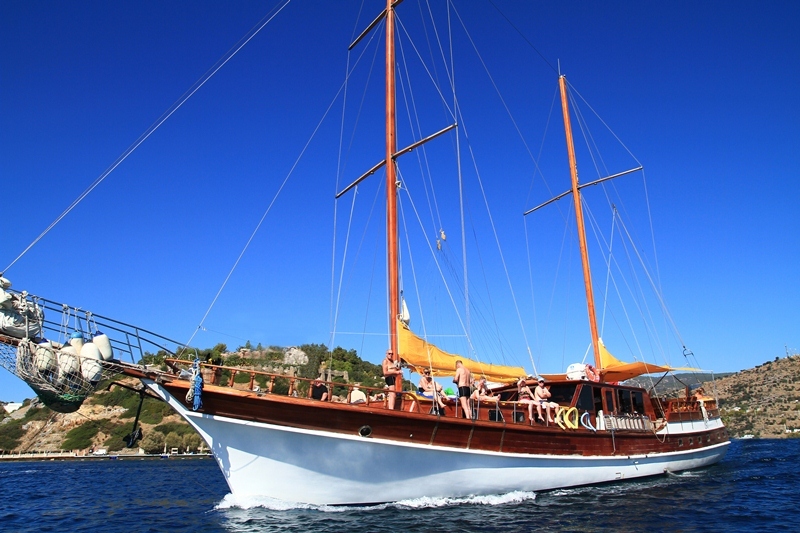 Finally we will sail to Fethiye Harbour where we arrive between 3 and 4 p.m. – Accommodation in Fethiye. You will be dropped to Bus Station. We finish the tour with a visit to the Travertines (white calcium pools) where you will have time to take pictures and wade in the water. After leaving the site, we will have a late lunch, and then you will be dropped back to your hotel. You will stay 1 night in your hotel and you will have a free day in Pamukkale. You will be dropped to Bus Station at the night of free day. Ancient hospital, health center and propylaeum of the Temple of Athena. At the end of the tour you will be dropped to your hotel.